Putting in a saddle seat when building custom saddles is a process that can be a little challenging even for a seasoned saddle maker. In this video I show the process I use for getting the initial fit on a saddle seat during the build process. My seat pattern is not cut to fit so each one has to be fit to work on the tree I’m using at the time. The pattern is basically a big piece of leather that is almost square with relief cuts made to start the process of fitting it around the swells of the tree. Since this is the biggest piece of leather that is cut during the saddle building process, mistakes made here can get pretty expensive. After the seat is cut out there is only around one half of the side of leather left so if a mistake is made in this step then another side of leather will be needed to complete the saddle. Before the video started I already cut the seat out and cased it with water so that the entire seat is completely wet. 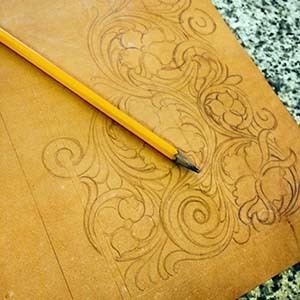 This allows the leather to be shaped and any stretch removed during the pulling in process. This also allows for ease of cutting the area around the swells and the ears as well as the shaping of the dish. In this video we are focusing mainly on the area around the swells and in a later video I will get into my process for cutting the ears. Be sure and subscribe to our mailing list to receive the latest news and updates on tutorials available on our site.